Took the bike out with the tank bag on. It works great. Doesn’t interfere with operating the bike at all and doesn’t impede my normal riding position. I am just touching the bag but it is not a distraction. 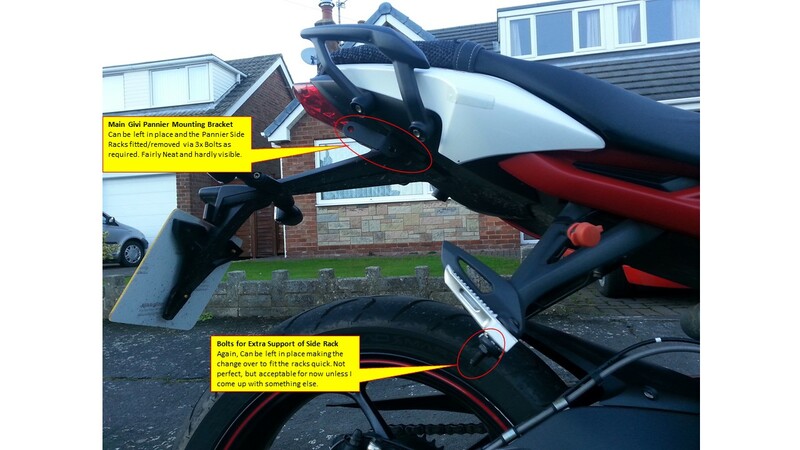 The clamp on the bottom of the bag can be placed in one of five positions to suit the bike and rider. 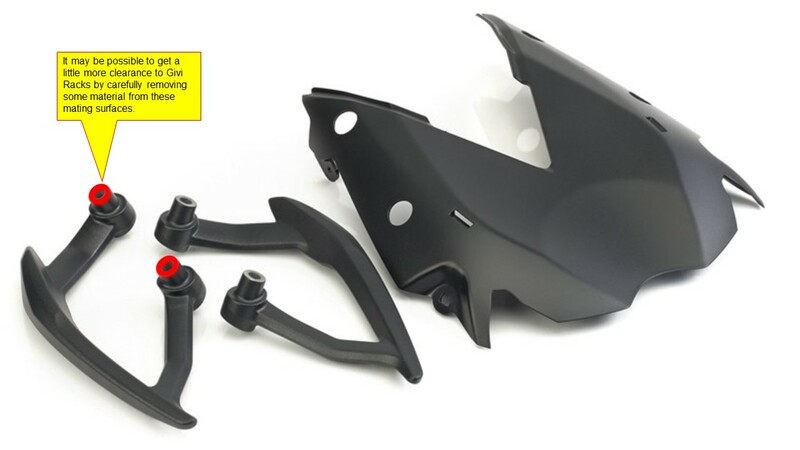 Were your Acerbis Dual handguards easy to fit? Did you need and special mods or bolts needed? 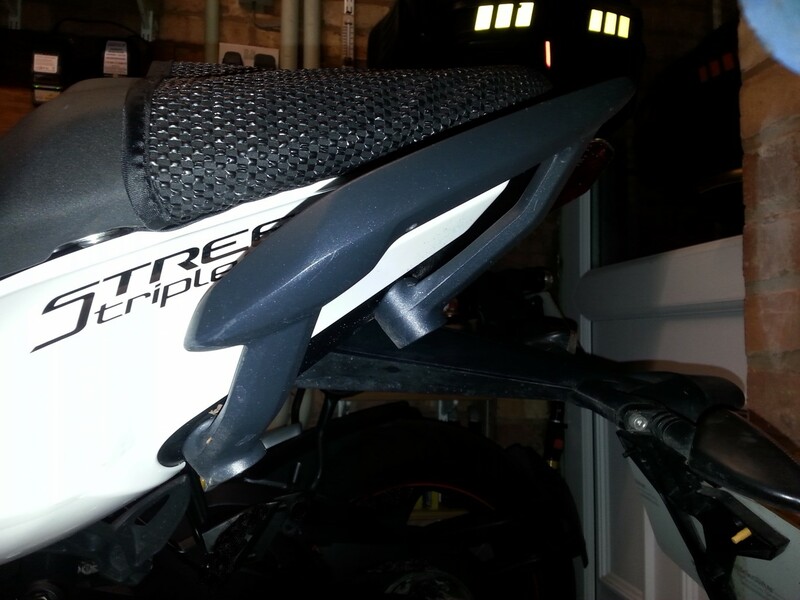 A quick 'heads up', I've just purchased the street tank bag for £45.00 at Triumph Direct. 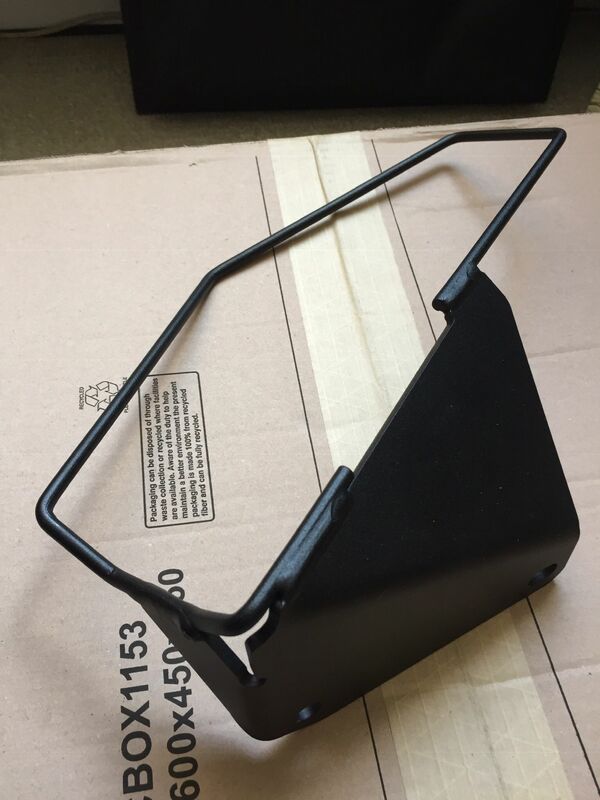 Picked up some SHAD pannier frames (T0ST65SE) that popped up cheap on Amazon. Bolt on the grab handle mount holes, and fit fine in conjunction with my SW Motech rack frame. Frames are good solid items and I’ll try some options for how to tread the straps under the seat. Apologies that you had to give me a, "Kick", to get me to put a post together to explain what luggage I ended up getting, (to be able to take a tent and gear on my 2015 STR). By the way, I see that you have gone for the Shad ones. Nice Job!, I hadn't heard of Shad before, and only recently realised that they make the Seats for the Street Triples, (and probably other Triumph seats). 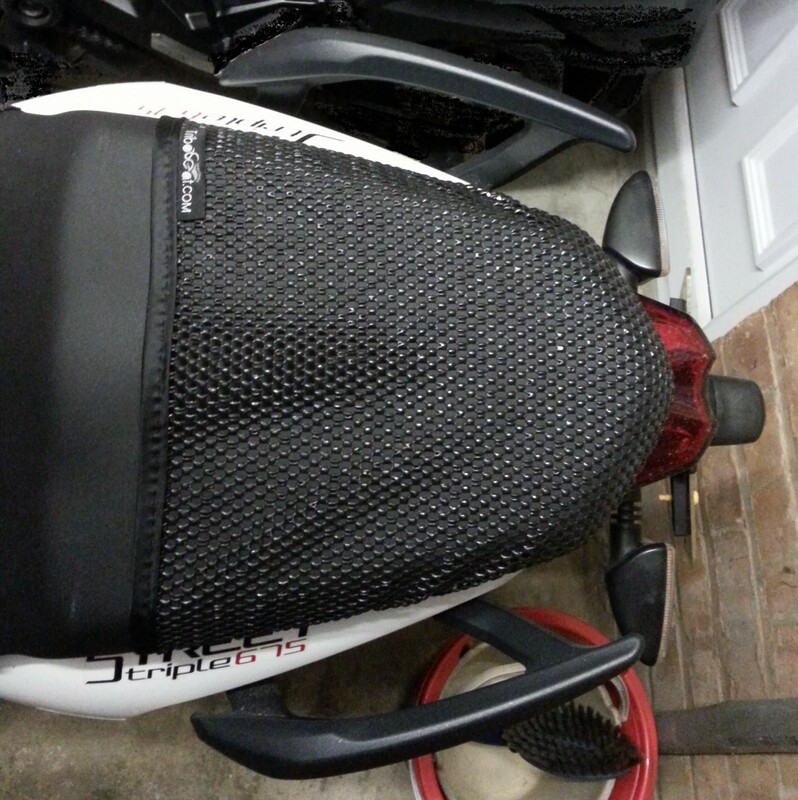 Background: I decided on getting panniers, to leave the pillion seat clear so that I have a chance of putting my, "Huge", (3x Man), Tent and bedroll etc on it. I recently bought some Grab Handles, mainly to make my Wife Diana feel a bit more secure in having something to hold onto, and to make it easier to manoeuvre the bike in the garage. So I was hoping to be able to keep the Grab handles on at the same time. 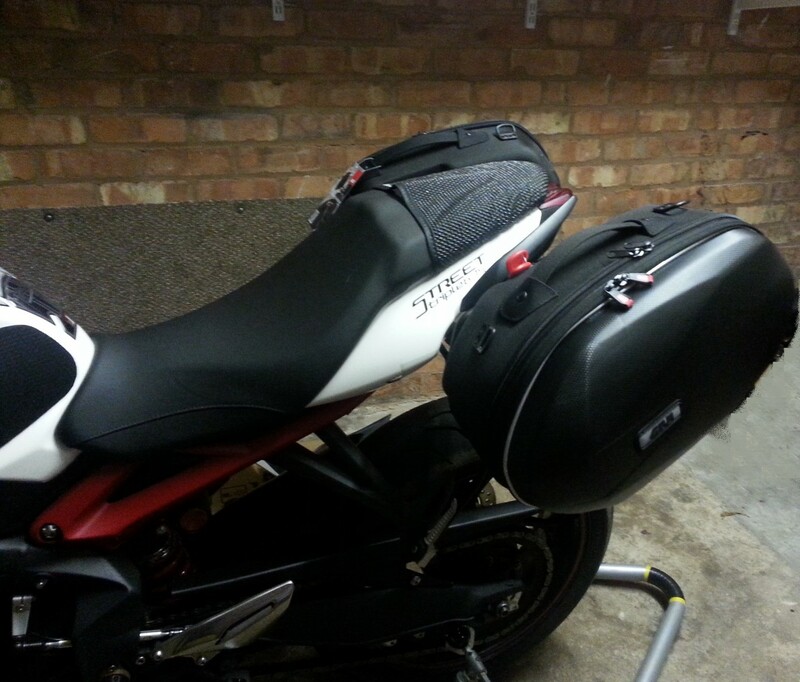 I would have preferred hard luggage, but couldn't find any racks I was happy with for the Street Triple, so opted for Soft Luggage. I was very tempted by the Shad, and the SW Motech Semi Rigid ones, they look really good. 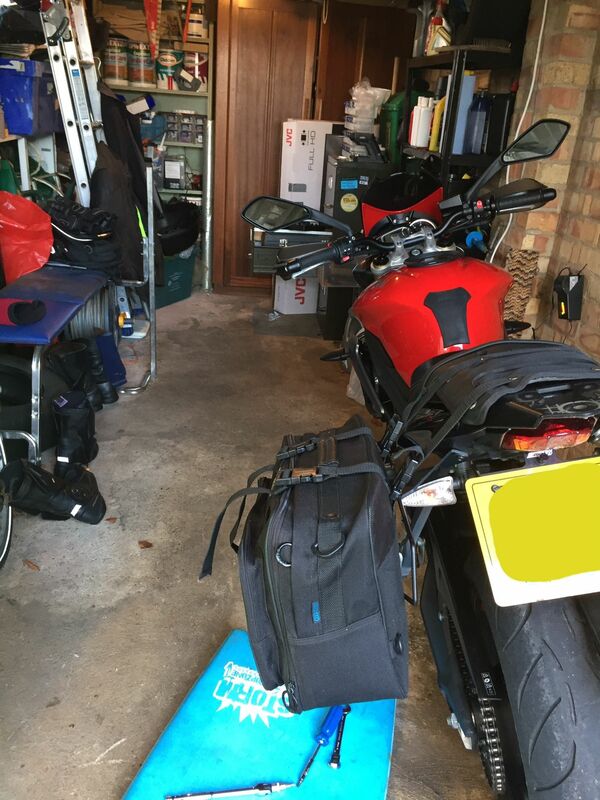 However, I thought the Givi Quicklock Racks might be more able to cope with some of the potential weight of my Tent etc, resting on the top of them, (because they are braced by stays which bolt to the pillion pegs). 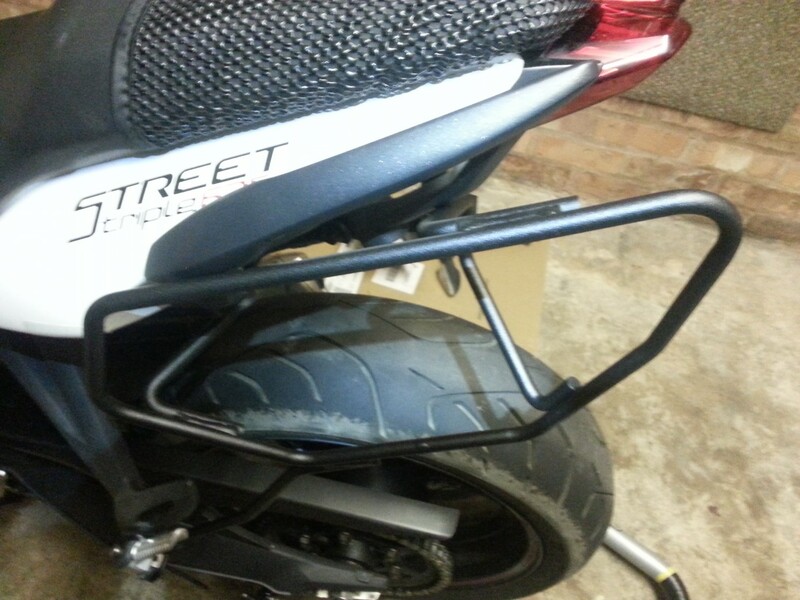 No-One seemed to know if the Givi Racks could be used with the Grab Handles in place, so with a 365 day returns policy at SportsbikeShop, I decided to order the Givi ones from them, the only way to find out for sure. So the following pic's show a trial I did to see if I could have the Grab Handles on, with the racks at the same time. 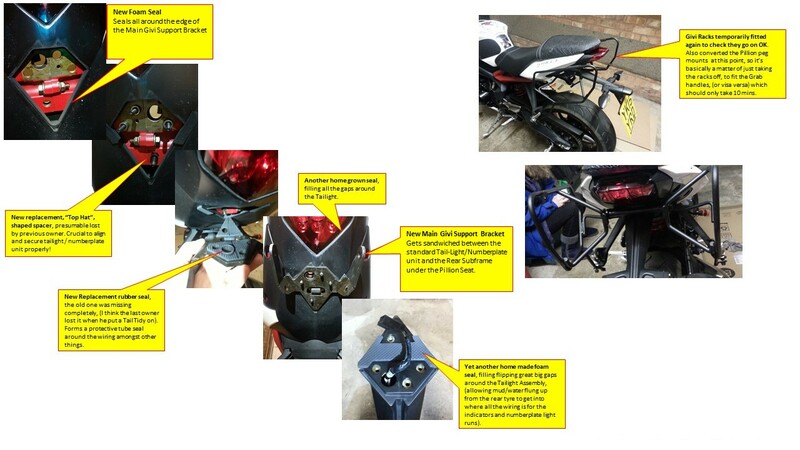 What I found out was, that although they just about fit, as can bee seen in the pic's, they do foul with each other, making it difficult to fit and remove the panniers. I think it would also be quite difficult to use the Grab Handles. With some mod's, (like packing out the racks a few mm). it might be possible, but at this point I just decided I would take the Grab Handles off when I use the Panniers, and swap back afterwards, Simples! I can't see any way that I could get all my gear, and Tent, and my Wife on my Street Triple anyway, so when I do go camping, I will be riding solo, so no problem really. I like the overall look, and the way they fit, and can now take side racks on and off the bike, with just 3 Bolts per side, (then re-fit the Grab Handles). 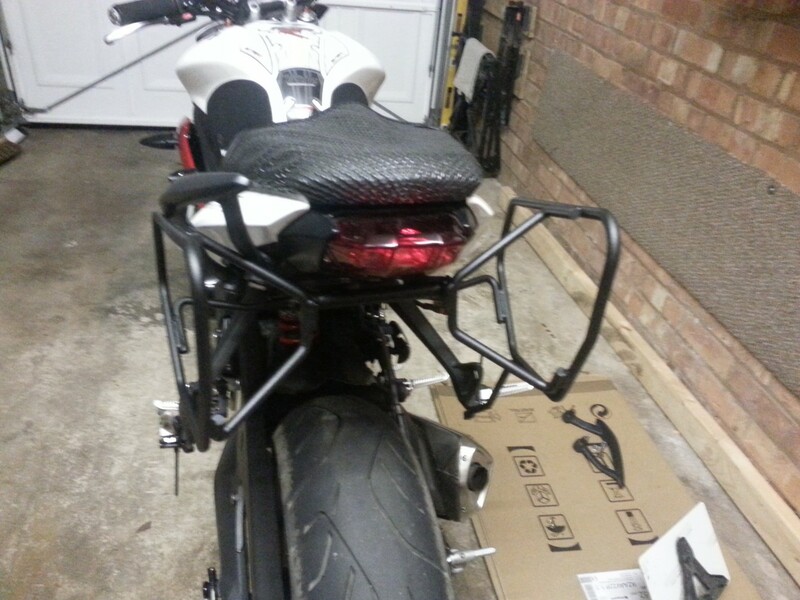 Leaving the main support bracket, hardly visible, under the pillion seat, when I don't have the side racks fitted. 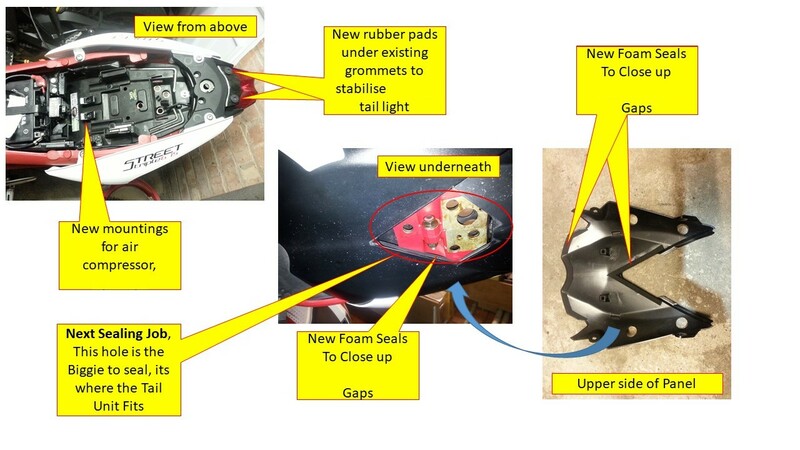 Already working on ways to reduce the incredible amount of muck thrown everywhere off the back wheel of the Street Triple, (another post in the making)?, I was a bit bothered by the amount of extra gaps that the Main Givi Support Bracket creates, when it gets sandwiched between the rear sub-frame and the tailight/numberplate/indicator support, ("Blackpool Tower")! I then realised that some of the gaps, and a general, "looseness/misalignment", of Blackpool Tower, were caused because the previous owner must have had a tail-tidy fitted at one point, and had lost a, "top-hat" spacer, and a rubber seal when he put the standard set up back on. So long story short I ended up buying the missing parts, stripping down the rear end, and making up some seals, so here's a leaflet about it. Here's a pic showing what the bike looks like with the Pannier Side Racks removed, but the mounting brackets left in place. Wow, Mitch, when you post you post. 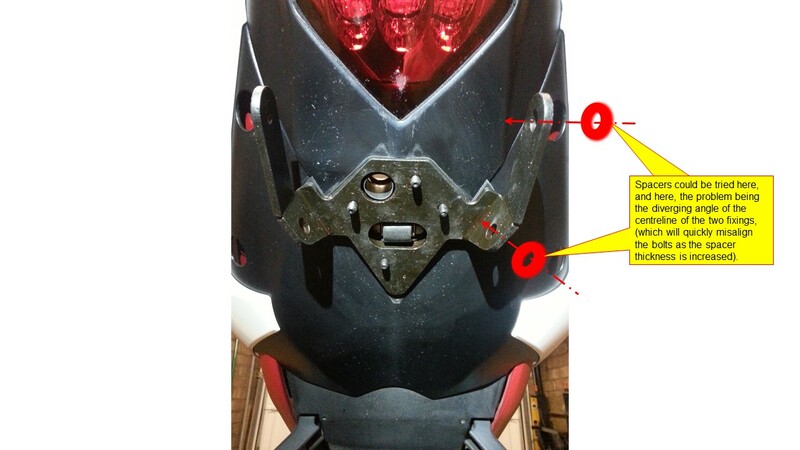 Great info, love the details on the GIVI frame mounting points. thank you for answering the very question I've been trying to get an answer to. 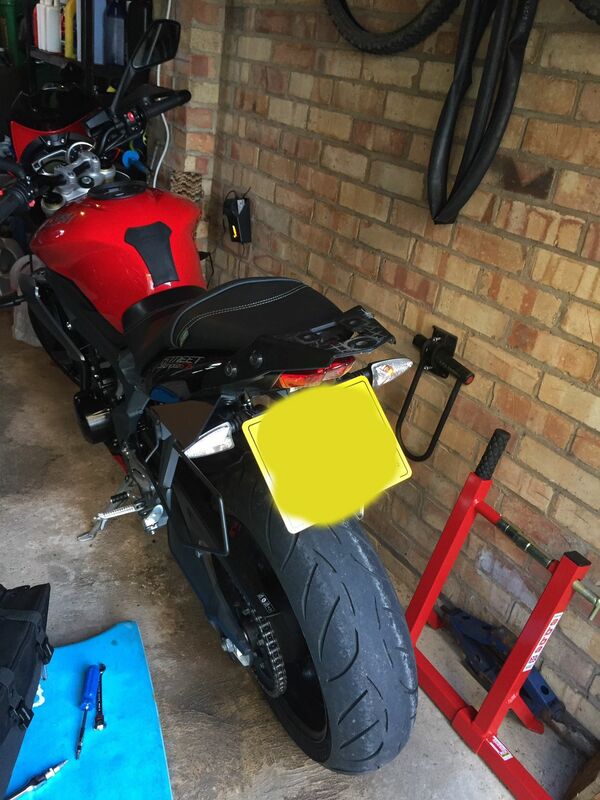 I ride a 2016 Street Triple R and have the same set up as yours ... grab handles and have ordered exactly the same Givi saddlebags/mounting racks. Well..., if you are careful and determined, and willing to do a bit of thinking to achieve it, then Yes, I think it's entirely possible. It just doesn't seem worth it, or necessary for my particular need's to do it. I think it's easier just to take the Grab Handles off when I am using the Panniers. Not least because of the value of these parts. Plus I usually like to be able to revert, things back to standard again. I would be interested to know why it would be a help for you? Anyway, here were my thoughts about possible ways of doing it, in case it help's you. (Disclaimer, proceed at your own risk, don't come back to me if it all ends in tears!! I haven't done it, I thought about it, and decided NOT TO, so your mileage may vary)! Possible, but there looks to be very limited scope to do this, and I guess that only a few mm, (est 1-3mm), might be gained, because of the way the Grab Handles are shaped, to fit quite closely to the curved side panels. It's quite tricky for several reasons, not least because the Grab Handles are stepped, (like a Top Hat), where they fit into the holes in the panel, and the steps are not straight, (again to match the curve of the side panel). Because of this there isn't much, "meat", to be removed before the Grab Handles will touch the Side Panels. It would be a matter of ideally machining a little off the end's of the tube of the Grab Handle at a time and trying them, (whilst keeping the machined ends flat to match the original angle, where they mate up against the underside of the Rear Subframe. Doing it with a Hand File, and still getting it right, would need someone with decent fitting skill's. Summary: Not much to be gained, worse case scenario - Take to much off, and the Grab Handles will foul with the Side Panels. Get the angle of the mating faces of the Grab Handles to the Rear Subframe wrong, and there could be a bigger foul with the Side Panels. #2) Space the Side Racks further Apart, (away from each other and the Grab Handles). Certainly possible. It's just how much. My estimate was that 5mm per side was probably feasible. At least this route can be trialled using packs of washers, until the desired result is achieved, (or not)!, but not by much without permanent mods. 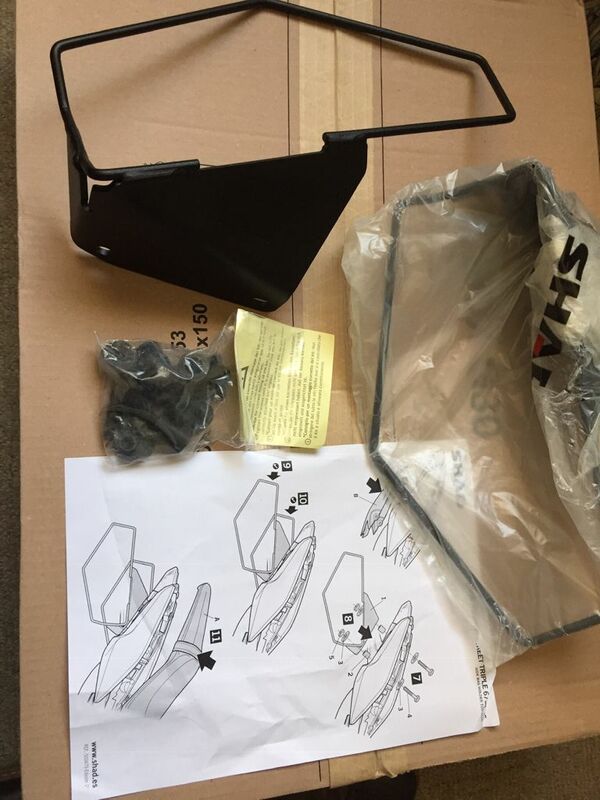 Likely Issues: There are only two mounting points on the Main Support Bracket, which the top two fixings on the side racks fit to. However, they are at different angles. So using 1mm packing washers, looked possible, (with a bit of wrangling), but because of the angles involved, using spacers any thicker, means the fixings quickly become misaligned to the point where the racks, and/or the Main mounting bracket are probably going to have to be modified. Maybe a combination of opening the holes out into slots, and bending the mounting points to different angles would do the trick. The stay which goes down to the pillion seat peg would need adjusting as well I reckon. The bonus of this method, is that it can be tried up to a point, and probably even up to using 5mm spacers, without permanent mods, by just leaving out one of the top two fixings, and seeing what's feasible. Of course, you could combine both methods too.